The official languages of Canada are English and French, which "have equality of status and equal rights and privileges as to their use in all institutions of the Parliament and Government of Canada," according to Canada's constitution. "Official bilingualism" is the term used in Canada to collectively describe the policies, constitutional provisions, and laws that ensure legal equality of English and French in the Parliament and courts of Canada, protect the linguistic rights of English and French-speaking minorities in different provinces, and ensure a level of government services in both languages across Canada. At the provincial level, New Brunswick officially recognizes the equal status of French and English. While French has equal legal status in Manitoba restored due to a court ruling that struck down seventy-year-old English-only laws in 1985, in practice, French language services are only provided in some regions of the province. Quebec has declared itself officially unilingual (French only). Alberta and Saskatchewan are also considered unilingual (English only). In practice, all provinces, including Quebec, offer some services in both English and French and some publicly funded education in both official languages up to the high school level (English language postsecondary education institutions are also present in Quebec, as are French language postsecondary institutions in other provinces, in particular in Manitoba, Ontario and New Brunswick). English and French are official languages in all three territories. In addition, Inuktitut is also an official language in Nunavut, and nine aboriginal languages have official status in the Northwest Territories. Plains Indian Sign Language (spoken by speakers of 37 oral languages in 12 families spread across an area of 2.6 million square kilometres stretching from what are now northern Mexico to the southern Northwest Territories, and from the Pacific Northwest to the Saint-Laurence Seaway). French has been a language of government in the part of Canada that is today Quebec, with limited interruptions, since the arrival of the first French settlers in Canada in 1604 (Acadians) and in 1608 in Quebec, and has been entrenched in the Constitution of Canada since 1867. English has been a language of government in each of the provinces since their inception as British colonies. Institutional bilingualism in various forms therefore predates the Canadian Confederation in 1867. However, for many years English occupied a de facto privileged position, and French was not fully equal. The two languages have gradually achieved a greater level of equality in most of the provinces, and full equality at the federal level. In the 1970s French in Quebec became the province's official language. ‘The first Europeans after the Vikings came not as settlers but to exploit the country by trade with the Indians. They were both English and French speaking and had wars among themselves to gain access to this trade. The actual settling of the land took place much later. The French were the first settlers in 1617, but as early as 1660 a German was mentioned as a settler in the records of Quebec. The first English settlers came only a hundred years later, and here we discover a great paradox: These first ten ships full of ‘English’ settlers were exclusively German. In 1745 they founded Waldoburg and 8 years later Lunenburg in the province we now know as Nova Scotia. These Protestant Germans were actually recruited in Germany by the British Government to offset the existing French Catholics. Later the governor of Nova Scotia who had already settled in Pennsylvania to move to “Nova Scotia, which will be materially strengthened by the acquisition of these frugal, laborious, and industrious people who will not only improve and enrich their property, but if need be, pertinaciously defend it.” It may surprise us that these first German settlers are “virtually the first English-speaking Canadians” (A.R. Lower). They were English not because of their origin, but because they learned English fast, anglicized their names, and wrote themselves as ‘English’ into the records. ‘It is important to pause here and to investigate why people from a highly civilized country wanted to forget their own language and culture and adopted a false ancestry. It is particularly important, because they were the first but not the last to behave like this. Their reasons for doing so may give us a clue as to why all Caucasian ethnic groups, except the English, behaved likewise including even members from the geographically well-protected French group […]. ‘The reason for this strange behaviour is to be found in the ‘almost militant pride’ of the English in their origin. The lost wars against the Americans, who seceded from the English crown, had seriously hurt their pride. Compensating for this, they wanted to create a precise replica of their beloved England in Canada. They displayed an “ultra-British attitude which was heavy with emotion and excluded rational discussion.” They tried to be English to the core in political and social institutions and in their whole life-style. It is here that we find the seeds for the difficulties we face today. This attitude allowed a snobbism to develop, so much resented openly by French-Canadians today and felt by all the other groups too, even if they do not yet feel secure enough to voice their objection. Certain English families demanded special “public favours, power, and office as their birthright.” The desire to have the same privileges for a good start caused the Germans to choose to give up their identity rather than be second class citizens. Today many may say that this was a smart move, especially in light of the fate of another group of German settlers who came later to Ontario. ‘The 64 German families to whom Toronto owes its existence had not made an attempt to anglicize and did not fare as well as their earlier compatriots in Nova Scotia. The Lieutenant-Governor of Upper Canada, John Graves Simcoe, found the strategic spot where Canada’s most populous city, Toronto, now stands. Actually this place existed only on paper until 1794 when 180 Germans, under the leadership of the first architect of Upper Canada, Albrecht Ulrich Moll, came, cleared Yonge Street and built the first houses. They accomplished this completely on their own. In return, each family was promised to receive 1000 acres one year later, but the government broke its word to the “suspicious aliens” who “could neither be trusted nor legally hold land before seven years’ residence here as subjects of the Crown. In desperation Moll travelled to the king of England to save his people, who had used up all their reserves during that one year of hard pioneer work. Though the king acknowledged that the settlers had kept their side of the contract and were therefore entitled to the 64 000 acres guaranteed to them, he made it dependent of the approval of the government of Upper Canada, which did not honour the agreement. A disastrous time of famine and death followed for the betrayed group of pioneers. ‘The Germans participated not only in the earlier stages of settlement but came in great numbers to Canada. [...] They also fought in the French and English armies, even in leading positions. For example, in 1755, a Baron von Dieskau from Saxony was appointed Supreme commander of the French troops in North America and General von Riedesel was commander of the German troops fighting under British colours. His wife introduced the first illuminated Christmas tree in Canada in 1781. Of special interest is the Proclamation of Lord Dorchester from July 24, 1788. It created four new districts which had German names and were to become the provinces of Upper Canada, namely Luneburg, Mecklenburg, Nassau and Hesse. From 1876 to 1996, the Government of Canada operated the Canadian Indian residential school system which the Truth and Reconciliation Commission of Canada described as cultural genocide. This system, combined with education, immigration, and other policies promoting English and French, contributed greatly to the promotion of English and French across Canada. ‘John Alexander Macdonald, the first Prime Minister of Canada, is credited with creating a nation through the construction of this band of steel [the transcontinental railroad] linking the Atlantic with the Pacific Ocean. But in order to transform this dream into reality not only political battles had to be won. Thousands of tough labourers had to be found willing to do the actual work which, particularly in the granite canyons of the Western mountains, was not just hard but outright dangerous. Not many Canadians were willing to work for $1.50 a day, considered low even in those days. It soon became apparent that only by the hiring of 6000 collies from China could the railroad be built. They were even willing to work for $1.00 a day and had to give a percentage from that to the company that brought them over. And they worked well. A white foreman was amazed at their endurance and willingness: “I moved 2000 Chinese with all their belongings on their backs 25 miles and they were working normally the next day. With white workers this would have taken me a week.” Instead of either lowering their own expectations or just accepting the fact that foreigners were willing to work for less and get the railroad built, Canadians changed the virtues of these industrious foreigners into a crime. Anti-Chinese feelings ran high, even in areas where the Chinese were unknown such as Winnipeg, whose ‘Times’ wrote about the ‘immoral children of China’ who had ‘no sense whatever of any principle of morality’ and even dared to add: “it is an established fact that dealings with the Chinese are attended with evil results.” But according to their white foreman, not a single incident of dishonesty was known during all the years the Chinese worked on the railroad. English and French have had limited constitutional protection since 1867. Section 133 of the Constitution Act, 1867 guarantees that both languages may be used in the Parliament of Canada, in its journals and records, and in court proceedings in any court established by the Parliament of Canada. The section also mandates that all Acts of the Parliament of Canada be printed and published in both languages. Guarantees for the equal status of the two official languages are provided in sections 16–23 of the Canadian Charter of Rights and Freedoms, which became law in 1982. Sections 16–19 guarantee the equal status of both languages in Parliament, in all federal government institutions, and in federal courts. These sections also mandate that all statutes, records and journals of Parliament be published in both languages, with the English and French versions both holding equal status before the courts. Section 20 guarantees the right of the Canadian public to communicate in English and French with any central government office or with regional offices where there is "a significant demand for communication with and services from that office". Significant demand is not defined in the Charter of Rights and Freedoms. One of the purposes of the Official Languages Act of 1988 was to remedy this omission. The Charter of Rights and Freedoms includes similar constitutional obligations making New Brunswick the only officially bilingual province in Canada. Section 21 ensured that the new Charter of Rights and Freedoms would be read as supplementing, rather than replacing any rights of the English and French languages, which had been constitutionalized prior to 1982. Section 22 ensured that the new Charter of Rights and Freedoms would not be interpreted by the courts as placing any new restrictions on non-official languages. Section 23 provides a limited right to receive publicly funded primary and secondary-schooling in the two official languages when they are "in a minority situation"—in other words, to English-language schooling in Quebec, and to French-language schooling in the rest of the country. In Quebec, a child may receive free public education in English only if at least one parent or a sibling was educated in Canada in English. In the rest of Canada, a child may receive free public education in French if at least one parent or a sibling was educated in Canada in French, or if at least one parent has French as his or her mother tongue (defined in section 23 as "first language learned and still understood"). None of these education language rights precludes parents from placing their children in a private school (which they pay for) in the language of their choice; it applies only to subsidized public education. One practical consequence of this asymmetry is that all migrants who arrive in Quebec from foreign countries only have access to French-language public schools for their children. This includes immigrants whose mother tongue is English and immigrants who received their schooling in English. On the other hand, Section 23 provides a nearly universal right to English-language schooling for the children of Canadian-born anglophones living in Quebec. Section 23 also provides, subject only to the "where numbers warrant" restriction, a right to French-language schooling for the children of all francophones living outside Quebec, including immigrants from French-speaking countries who settle outside Quebec, and who are Canadian citizens. Another element of asymmetry between Quebec and most anglophone provinces is that while Quebec provides public English-language primary and secondary education throughout the province, most other provinces provide French-language education only "where numbers warrant". The rights attach to the parent, not the child, and non-citizens residing in Canada do not have access to this right (even if their children are born in Canada). If the parents' English-language or French-language education took place outside Canada, this does not entitle the child to be educated in that language. The right to receive public funding can only be exercised in localities where "...the number of children of citizens who have such a right is sufficient to warrant the provision to them out of public funds...."
The phrase, "where numbers ... warrant" is not defined in Section 23. Education is under provincial jurisdiction, which means that it has not been possible for Parliament to enact a single nationwide definition of the term, as the 1988 Official Languages Act did for the constitutional obligation to provide federal services where “there is a sufficient demand.” As a result, disputes over the extent of the right to a publicly funded minority-language education have been the source of much litigation. The defining case was Mahe v. Alberta (1990), in which the Supreme Court of Canada declared that section 23 guaranteed a "sliding scale". In certain circumstances, the children whose parents could exercise the right might be so few that literally no minority language education may be provided by the government. With a greater number of children, some schools might be required to provide classrooms in which the children could receive minority language education. An even greater number would require the construction of new schools dedicated solely to minority language education. More recent cases, which have significantly extended these rights, include Arsenault-Cameron v. Prince Edward Island (2000) and Doucet-Boudreau v. Nova Scotia (Minister of Education) (2003). Many of the documents in Canada's Constitution do not have an official French-language version; for legal purposes only the English-language version is official and any French translations are unofficial. In particular, the Constitution Act, 1867 (which created Canada as a legal entity and still contains the most important provisions of governmental powers) has no official French-language version, because it was enacted by the United Kingdom Parliament, which functions in the English language exclusively. Similarly, all other parts of the Constitution that were enacted by the United Kingdom (with the important exception of the Canada Act 1982) have no official French-language version. Sections 55–57 of the Constitution Act, 1982 set out a framework for changing this situation. Section 55 calls for French versions of all parts of the Constitution that exist only in English to be prepared as quickly as possible. Section 56 provided that, following adoption of the French versions, both the English-language and French-language versions would be equally authoritative. To avoid the situation where an inaccurately translated French version would have a weight equal to the English original, Section 55 requires that the French-language versions be approved using the same process under which actual constitutional amendments are adopted. Pursuant to section 55, a French Constitutional Drafting Committee produced French-language versions of all the British North America Acts in the decade following 1982. However, these versions were never ratified under the Constitution’s amendment procedure, and therefore have never been officially adopted. Section 57 states that the “English and French versions of this Act [ie. the Constitution Act, 1982] are equally authoritative.” The purpose of this provision is to clear up any ambiguity that might have existed about the equal status of the two versions as a result of the novel way in which this part of Canada's supreme law came into force. Had the Constitution Act, 1982 been enacted as most preceding amendments to Canada's constitution had been, as a statute of the British parliament, it would, like any other British statute, have been an English-only document. Instead, the British parliament enacted a very concise law, (the Canada Act 1982), written in English only. The operative clauses of the Canada Act, 1982 simply state that an appendix to the Act (the appendix is formally referred to as a "schedule") is to be integrated into the Canadian constitution. The schedule contains the complete text of the Constitution Act, 1982, in both English and French. A bilingual sign in Canada. Canada adopted its first Official Languages Act in 1969, in response to the recommendations of the Royal Commission on Bilingualism and Biculturalism. The current Official Languages Act was adopted in 1988 to improve the 1969 law's efforts to address two basic policy objectives: (1) to specify the powers, duties and functions of federal institutions relevant to official languages; (2) to support the development of linguistic minority communities. As well, following the adoption in 1982 of the Charter of Rights, it was necessary to create a legislative framework within which the Government of Canada could respect its new constitutional obligations regarding the official languages. In addition to formalizing Charter provisions in Parts I through IV, the Act adopts several specific measures to achieve these objectives. For example, Part V specifies that the work environment in federal institutions in the National Capital Region and other prescribed bilingual regions be conducive to accommodating the use of French and English at work. Part VI mandates that English-speaking Canadians and French-speaking Canadians not be discriminated against based on ethnic origin or first language learned when it comes to employment opportunities and advancement. Finally, the Act establishes a Commissioner of Official Languages and specifies their duties to hear and investigate complaints, make recommendations to Parliament, and delegate authority in matters pertaining to official languages in Canada. Canada's current Commissioner of Official Languages is Raymond Théberge. Section 32 of the Official Languages Act authorizes the Governor in Council (i.e., the federal cabinet) to issue regulations that define the geographic regions where the federal government offers services in the relevant minority language (English in Quebec and French elsewhere). This provides a legal definition for the otherwise vague requirement that services be provided in the minority official languages wherever there is "significant demand." The definition used in the regulations is complex, but basically an area of the country is served in both languages if at least 5,000 persons in that area, or 5% of the local population (whichever is smaller), belongs to that province's English or French linguistic minority population. Regulations were first promulgated in 1991. In Canada, however, one of the two language groups begins with a considerable advantage. As the national language of the United States, one of the most powerful countries of the world, English has a massive preponderance in North America. Thus the English-language group in this country draws much of its strength from the English-speaking population of our neighbour. The French-language group is, on the other hand, a minority on the North American continent and suffers from its isolation not only from France but from the other French speaking peoples of the world. The issue of proportional hiring and promotion of speakers of both official languages has been an issue in Canadian politics since before Confederation. Members of each linguistic group have complained of injustice when their group have been represented, in public service hiring and promotion, in numbers less than would be justified by their proportion of the national population. For the greater part of Canada’s history, French-speakers were underrepresented, and English-speakers were overrepresented in the ranks of the public service, and the disproportion became more pronounced in the more senior ranks of public servants. However, this trend has reversed itself in recent decades. The first high-profile complaint of preferential hiring took place in 1834. One of the Ninety-Two Resolutions of the Lower Canadian House of Assembly drew attention to the fact that French Canadians, who at the time were 88% of the colony's population, held only 30% of the posts in the 157-member colonial civil service. Moreover, the resolution stated, French Canadians were, "for the most part, appointed to the inferior and less lucrative offices, and most frequently only obtaining even them, by becoming the dependent of those [British immigrants] who hold the higher and the more lucrative offices...."
With the advent of responsible government in the 1840s, the power to make civil service appointments was transferred to elected politicians, who had a strong incentive to ensure that French Canadian voters did not feel that they were being frozen out of hiring and promotions. Although no formal reform of the hiring and promotion process was ever undertaken, the patronage-driven hiring process seems to have produced a more equitable representation of the two language groups. In the period between 1867 and the turn of the Twentieth Century, French-Canadians made up about one-third of the Canadian population, and seem also to have represented about one-third of civil service appointments at junior levels, although they had only about half that much representation at the most senior level. Canada's thirteen provinces and territories have adopted widely diverging policies with regard to minority-language services for their respective linguistic minorities. Given the wide range of services, such as policing, health care and education, that fall under provincial jurisdiction, these divergences have considerable importance. Of Canada's ten provinces, only one (New Brunswick) has voluntarily chosen to become officially bilingual. New Brunswick's bilingual status is constitutionally entrenched under the Canadian Charter of Rights and Freedoms. Sections 16–20 of the Charter include parallel sections guaranteeing the same rights at the federal level and at the provincial level (New Brunswick only). Section 16(2) is a largely symbolic statement that "English and French are the official languages of New Brunswick" with "equality of status". Section 18(2) states that New Brunswick's laws will be bilingual, with both texts equally authoritative, and that official publications will be bilingual. Section 19(2) guarantees the right to use either official language in all New Brunswick court proceedings. Section 20(2) guarantees the right to receive provincial government services in either official language. Manitoba is the only province that was officially bilingual at the time of its establishment. Following the Red River Rebellion led by the Francophone Métis Louis Riel, the Manitoba Act was passed, creating the province and mandating the equal status of English and French in all legislative bodies, legislative records, laws and court proceedings. At this time, Manitoba had a majority Francophone population, but within 20 years mass immigration from Ontario and non-Francophone countries had reduced the Francophone proportion of the population to less than 10%. In 1890, the provincial government of Thomas Greenway stripped funding from the French school system and revoked the equal status of French, a controversial move that caused tension between French and English speakers throughout Canada. Despite the protests of Franco-Manitobans that the Manitoba Act had been violated, Manitoba remained monolingual in practice until the early 1980s, when legal challenges created a crisis that threatened to invalidate almost all laws passed in Manitoba since 1890, on the grounds that these statutes were not published in French as required by the Manitoba Act. The provincial government under Howard Pawley tried and failed to address the crisis, with the opposition refusing to attend legislative sessions. In 1985 the Supreme Court ruled that the Manitoba Act had been violated and that all provincial legislation must be published in both French and English, restoring the legal equality of the languages that had existed when the province was created. While this restoration of legal equality faced overwhelming public opposition at the time, polls taken in 2003 showed a majority of Manitobans supported provincial bilingualism. Due to Manitoba's unique history, it has a complex bilingual profile combining that of a province with a "small official-language minority and one with constitutional protection of said minority". Currently, the French Language Services Policy guarantees access to provincial government services in French, though in practice French language services are available only in some areas. Public primary and secondary education is provided in both French and English, and parents are free to choose instruction in either language. Post-secondary Francophone education is provided by the Université de Saint-Boniface, the oldest university in Western Canada. French has been the only official language in Quebec since 1974, when the Liberal government of Robert Bourassa enacted The Official Language Act (better-known as "Bill 22"). However, the province's language law does provide for limited services in English. As well, the province is obliged, under Section 133 of the Constitution Act, 1867, to allow the provincial legislature to operate in both French and English, and to allow all Quebec courts to operate in both languages. Section 23 of the Charter applies to Quebec, but to a more limited degree than in other provinces. Quebec is required to provide an education in English to all children whose Canadian citizen parents were educated in English in Canada, while all other provinces are required to provide an education in French to the children of Canadian citizen parents who either received their education in French in Canada or whose native tongue is French. In 1977, the Parti Québécois government of René Lévesque introduced the Charter of the French Language (better known as "Bill 101") to promote and preserve the French language in the province, indirectly disputing the federal bilingualism policy. Initially, Bill 101 banned the use of all languages but French on most commercial signs in the province (except for companies with four employees or fewer), but those limitations were later loosened by allowing other languages on signs, as long as the French version is predominant. Bill 101 also requires that children of most immigrants residing in Quebec attend French-language public schools; the children of Canadian citizens who have received their education in Canada in English may attend English-language public schools, which are operated by English-language school boards throughout the province. The controversy over this part of Quebec's language legislation has lessened in recent years as these laws became more entrenched and the public use of French increased. Quebec's language laws have been the subject of a number of legal rulings. In 1988, the Supreme Court of Canada ruled in the case of Ford v. Quebec (A.G.) that the commercial sign law provisions of Bill 101, which banned the use of the English language on outdoor signs, were unconstitutional. In 1989, the Quebec National Assembly invoked the "Notwithstanding Clause" of the Charter of Rights to set aside enforcement of the court ruling for five years. A UN appeal of the 'McIntyre Case' resulted in a condemnation of Quebec's sign law — regardless of the legality of the notwithstanding clause under Canadian law. In response, in 1993 Quebec enacted amendments to the sign law, availing itself of the suggestions proposed in the losing 1988 Supreme Court ruling by allowing other languages on commercial signs, subject to French being markedly predominant . On March 31, 2005, the Supreme Court of Canada ruled unanimously that the interpretation made by the provincial administration of the "major part" criterion in Quebec's language of instruction provisions violated the Canadian Charter of Rights and Freedoms. This criterion allows students who have completed the "major part" of their primary education in English in Canada to continue their studies in English in Quebec. The Court did not strike down the law but, as it had done in its 1988 ruling on sign laws, presented the province with a set of criteria for interpreting the law in conformity with the Charter of Rights, broadening the interpretation of the phrase "major part". French and English are official languages in Canada's three federal territories: Yukon, Nunavut, and the Northwest Territories. Nunavut and the Northwest Territories also accord official language status to several indigenous languages. Inuktitut and Inuinnaqtun are official languages in Nunavut because of the territory's Inuit population. The Northwest Territories accords official status to nine aboriginal languages (Chipewyan, Cree, Gwich’in, Inuinnaqtun, Inuktitut, Inuvialuktun, North Slavey, South Slavey and Tłįchǫ/Dogrib). NWT residents have the right to use any of the territory's eleven official languages in a territorial court and in debates and proceedings of the legislature. However, laws are legally binding only in their French and English versions, and the government publishes laws and other documents in the territory's other official languages only when asked by the legislature. Furthermore, access to services in any language is limited to institutions and circumstances where there is significant demand for that language or where it is reasonable to expect it given the nature of the services requested. In practice, this means that only English language services are universally available, and there is no guarantee that any particular government service will use other languages except the courts. Following a 2006 territorial supreme court ruling, Fédération Franco-Ténoise v. Canada (Attorney General), universal French-language services are also mandatory. This is despite the fact that the proportion of native French-speakers in the territories is negligible, and they are vastly outnumbered by speakers of indigenous languages. At the 2016 census, there were 1,455 "mother-tongue" speakers of French in Yukon (4.3%), 1,175 in the Northwest Territories (2.9%), and 595 in Nunavut (1.7%). The comments box in both French and English at the now-defunct Tim Hortons store in the SUNY Albany campus center. Although no Canadian province has officially adopted English as its sole official language, English is the de facto language of government services and internal government operations in Canada's seven remaining provinces. Service levels in French vary greatly from one province to another (and sometimes within different parts of the same province). For example, under the terms of Ontario's 1986 French Language Services Act, Francophones in 25 designated areas across the province—but not in other parts of the province—are guaranteed access to provincial government services in French. Similarly, since 2005, the City of Ottawa has been officially required under Ontario law, to set a municipal policy on English and French. In Alberta, the Alberta School Act protects the right of French-speaking people to receive school instruction in the French language in the province. There is considerable variation across Canada concerning the right to use English and French in legislatures and courts (federal, provincial and territorial). Rights under federal law are consistent throughout Canada, but different provinces and territories have different approaches to language rights. Three provinces (Manitoba, New Brunswick and Quebec) have constitutional guarantees for bilingualism and language rights. Three other provinces (Alberta, Ontario and Saskatchewan) have statutory provisions relating to bilingualism in the legal system, as do each of the three territories (Northwest Territories, Nunavut and Yukon). Four provinces (British Columbia, Newfoundland and Labrador, Nova Scotia and Prince Edward Island) are unilingual English. In Canada we see variation in provincials and territorials language legislatures. Alberta Yes. No: English only. Yes, but only in oral submissions, not written. British Columbia No: English only. No: English only. No: English only. New Brunswick Yes. Yes. Yes. Newfoundland and Labrador No: English only. No: English only. No: English only. Nova Scotia No: English only. No: English only. No: English only. Prince Edward Island No: English only. No: English only. No: English only. Saskatchewan Yes. Laws and regulations can be in English only, or in both English and French. Yes. Northwest Territories Yes, as well as any of the other nine official territorial languages. Yes. Yes. A party can also use one of the other nine official languages for oral submissions. Nunavut Yes, and also the Inuit language. Yes. Yes, and also the Inuit language. Yukon Yes, and also Yukon aboriginal languages. Yes. Yes. Nonetheless, the promotion of personal bilingualism in English and French is an important objective of official bilingualism in Canada. At least 35% of Canadians speak more than one language. Moreover, fewer than 2% of Canadians cannot speak at least one of the two official languages. However, of these multilingual Canadians, somewhat less than one fifth of the population (5,448,850 persons, or 17.4% of the Canadian population) are able to maintain a conversation in both of the official languages according to a self-assessment. However, in Canada the terms "bilingual" and "unilingual" are normally used to refer to bilingualism in English and French. In this sense, nearly 83% of Canadians are unilingual. Knowledge of the two official languages is largely determined by geography. Nearly 95% of Quebecers can speak French, but only 40.6% speak English. In the rest of the country, 97.6% of the population is capable of speaking English, but only 7.5% can speak French. Personal bilingualism is most concentrated in southern Quebec and a swath of territory sometimes referred to as the bilingual belt, which stretches east from Quebec through northern and eastern New Brunswick and west through Ottawa and that part of Ontario lying to the east of Ottawa, as well as north-eastern Ontario. There is also a large French-speaking population in Manitoba. In all, 55% of bilingual Canadians are Quebecers, and a high percentage of the bilingual population in the rest of Canada resides in Ontario and New Brunswick. Statistics Canada collects much of its language data from self-assessments. Canada’s thirteen provincial and territorial education systems place a high priority on boosting the number of bilingual high school graduates. For example, in 2008 New Brunswick's provincial government reconfirmed its goal of boosting the percentage of bilingualism among graduates from its current rate of 34% to 70% rate by 2012. In 2003, the federal government announced a ten-year plan of subsidies to provincial education ministries with the goal of boosting bilingualism among all Canadian graduates from its then-current level of 24% to 50% by 2013. Non-Francophone students learn French by taking courses on the French language as part of an education that is otherwise conducted in English. In Quebec and New Brunswick, French classes begin in Grade 1. In the other provinces, French classes typically start in Grade 4 or 5. Students normally receive about 600 hours of French-language classes by the time of graduation. The goal of “Core French” programs is not to produce fully bilingual graduates, but rather "to provide students with the ability to communicate adequately in the second language, and to provide students with linguistic tools to continue their second-language studies by building on a solid communicative base". There are no mandatory core French class in British Columbia, Alberta and Saskatchewan, and second-language courses are mandatory only in BC. One result of this is that comprehension levels are often lower than parents would prefer. A scholar who interviewed a former New Brunswick premier, as well as the province's deputy ministers of education and health and the chairman of its Board of Management and Official Languages Branch reports: "[A]ll expressed reservations about the effectiveness of the Core program in promoting individual bilingualism and believed the program must be improved if anglophone students are to obtain a level of proficiency in the French language." Non-Francophone students with no previous French-language training learn French by being taught all subjects in the French language, rather than by taking courses on the French language as part of an education otherwise conducted in English. In early immersion, students are placed in French-language classes starting in kindergarten or Grade 1. In late immersion, children are placed in French-language classes in a later grade. Currently, 7% of eligible students outside of Quebec are enrolled in French immersion programs. Some schools in Ontario offer a third method of FSL education: the Extended French program. Students enter into this program as early as Grade 4—the starting grade is set by each region's school board—and may continue the program through to graduation. The program can also be entered when beginning secondary school; however, as there is a prerequisite number of previous instruction hours, usually only students previously enrolled in the Extended French or French Immersion programs can enter. In this program, at least 25% of all instruction must be in French. From Grades 4 through 8, this means that at least one course per year other than "French as a Second Language" must be taught solely in French. From Grades 9 through 12, along with taking the Extended French language course every year, students must complete their mandatory Grade 9 Geography and Grade 10 Canadian History credits in French. Students who complete these required courses and take one extra credit taught in French receive a certificate upon graduation in addition to their diploma. Intensive French is a method of FSL education that originated in Newfoundland. In 2004, Intensive French began in some schools in British Columbia. Intensive French is a choice program (in offering schools) during the grade 6 year. For the first five months of the school year students spend 80% of their time learning French, with the other 20% being for math. The rest of the core curriculum (Social Studies, Science, and Language Arts in English) is condensed for the second half of the year, comprising 80% of the time, with one hour for French. In the grade 7 year students continue to have one hour of core French per day. This results in 600 hours of French instruction over the two years. New Brunswick, being an officially bilingual province, has both anglophone and francophone school districts. The francophone districts have Core English programs teaching ESL. Quebec's educations system provides ESL on a more restricted basis to the children of immigrants and to students who are members of the province's Francophone majority. Core English: Most non-anglophone students are required to enrol in French-language schools. English is taught to all students, starting in Grade 1, in a program that is essentially identical to the "Core French" taught to English-speaking students in the other provinces. Most high schools offer advanced-level ESL programs where students complete the K–11 program in Secondary 3 (Grade 9) and follow with first-language level in Grade 10 and 11 (literature class). Programs of English immersion have existed for French-speaking students in Quebec but these programs are often in conflict with the official language policies of the Quebec government. The same report ranks French orthography among the more difficult European ones to learn too. Orthographic, grammatical, lexical, and other rules and exceptions to and redundancies in them determine a language’s ease of learning. On page 81 of L’enseignement des langues étrangères comme politique publique, produced at the request of the Haut Conseil de l’évaluation de l’école (in France) in 2005, François Grin quotes a study from the Department of Pedagogical Cybernetics of the University of Paderborn that reveals how a French-speaker can reach the same level after 150 hours of Esperanto as he can after more than 1,000 of Italian and 1,500 of English. Section 4.6 of L’amélioration de l’enseignement de l’anglais, langue seconde, au primaire : un équilibre à trouver, published by the Conseil supérieur de l’éducation (in Quebec) in 2014 reveals a struggle to recruit enough qualified second-language teachers for public schools in Quebec too. ‘Many of the respondents cited inconsistency and quality control as major issues when it came to translation. The quality of the service varies greatly from one translator to another and there are often errors in the translations even when a request for a secondary review is made. Some respondents noted that the two language versions of committee reports often do not convey the same meaning and that, in some cases, the translation is simply erroneous. Much time is reportedly spent by senators and staff reviewing the documents in question and ensuring that the translation is accurate. Other respondents reported that longer documents that had been translated by more than one individual were disjointed and difficult to read because a common style had not been used. Recommendations ranged from the need to hire specialized translators to facilitate the translation of committee reports on technical matters, to ensuring proper revision of translations before their delivery, and to the need to provide for a feedback mechanism that could be used to alert the Translation Bureau when errors were detected. The linguistic provisions of the Canadian Charter of Rights and Freedoms, the Official Languages Act, the Consumer Packaging and Labelling Act, the Immigration and Refugee Protection Act, and other laws obligate a greater demand for English and French speakers (even foreign ones if necessary) than a freer linguistic market would require. This, combined with English and French being more difficult to learn than some languages due to their orthographic (especially for the Deaf, dyslexics, and Deaf-dyslexics), grammatical, and lexical particularities, accentuates the wealth gap between official and Deaf, indigenous, and other unofficial language communities by limiting market supply and blocking equal access to Federal and federally-regulated employment ranging from the packaging and labelling industries all the way up to appointments to the Supreme Court of Canada for unofficial language communities. Perry Bellegarde and Romeo Sagansh have addressed this concern as it applies to indigenous peoples. Senator Murray Sinclair has opposed requiring Supreme Court judges to know both official languages too. While the inherent difficulties of English and French can prevent some from learning them well, their international spread can greatly benefit those who have the means to learn them well. inquire into and report upon the existing state of bilingualism and biculturalism in Canada and to recommend what steps should be taken to develop the Canadian Confederation on the basis of an equal partnership between the two founding races, taking into account the contribution made by the other ethnic groups to the cultural enrichment of Canada and the measures that should be taken to safeguard that contribution. We should point out here that the Commission will not examine the question of the Indians and the Eskimos. Our terms of reference contain no allusion to Canada's native populations. They speak of "two founding races," namely Canadians of British and French origin, and "other ethnic groups," but mention neither the Indians nor the Eskimos. Since it is obvious that these two groups do not form part of the "founding races," as the phrase is used in the terms of reference, it would logically be necessary to include them under the heading "other ethnic groups." Yet it is clear that the term "other ethnic groups" means those peoples of diverse origins who came to Canada during or after the founding of the Canadian state and that it does not include the first inhabitants of this country. Still, as we have pointed out earlier, there is such a thing as a French culture and a British culture. Of course, the differences between them are not as great as they would be if either were compared to one of the many Asian or African cultures. In Canada, the Anglophones and the Francophones wear the same sort of clothing, live in the same sort of houses, and use the same tools . They are very similar in their social behaviour, belong to religions which are not exclusive, and share the same general knowledge. To a greater or lesser extent, they share a North American way of living. English and French Canadians of the Pacific Northwest sometimes used Chinook Jargon (also known as Chinuk Wawa) to interact not only with the local indigenous, Chinese, and other populations but even with one another up until at least 1900 after which it began to decline as a result of the Spanish flu, World War I, and the Canadian Indian residential school system. Some English and French Canadians have turned to Esperanto since at least 1901 in Quebec when A. P. Beauchemin founded the Esperanto group La Lumo (published from 1902 to 1904 and read by 1710 readers). Both Esperanto and Chinook Jargon (possibly fed in part by a combination of the low rate of success in official-second-language instruction in Canada's public schools, a growing belief in the need for reconciliation, the comparative ease of learning of these languages, the comparative grammatical precision of Esperanto conferring on it an advantage as a source language for translation and machine translation, the relative decline of English in an increasingly international world economy, and the advantages of direct communication in a standard language over translation and broken language) have experienced revivals since the 2000s leading to the publication of a self-instruction book for Chinuk Wawa in Esperanto in 2018. People have made use of the mobile application Amikumu to network with one another in Esperanto since 22 April 2017 and in other languages since the LangFest in Montreal on 25 August 2017. It has since spread to 130 countries speaking 525 languages. In Lament for a Notion, Scott Reid proposes maintaining the present official languages but deregulating them, limiting them mostly to the official sphere, and applying the territoriality principle except where numbers warrant it. Former Quebec Premier Jean Charest had called on the Federal Government to apply the Charter of the French Language to all federally-regulated institutions operating in the province of Quebec. Up until its reaction to the Government of Ontario's decision to eliminate the Office of the Commissioner of Francophone services in October of 2018, Quebec had tended to oppose calls on the part of French-speakers to broaden French-language rights outside of that province such as when it opposed the Commission scolaire francophone du Yukon’s call to gain the ability to admit more students to its French-language schools at the Supreme Court of Canada fearing that a victory for the French-language school board in the Yukon could have negatively affected the promotion of French in Quebec. ‘The head of the Assembly of First Nations is calling for the nearly 60 indigenous languages spoken in Canada to be declared official along with English and French, an expensive proposition but one that he says is becoming more urgent as the mother tongues of aboriginal peoples disappear. ‘Perry Bellegarde, who was elected National Chief of the AFN last fall, agrees it would not be easy to require translations of all indigenous languages to be printed on the sides of cereal boxes and milk cartons. ‘"That would be the ultimate goal," Mr. Bellegarde said in an interview on Wednesday at the three-day annual general meeting of the AFN, Canada's largest indigenous organization. "But let's do small steps to get there. "’ Romeo Saganash has expressed the belief that Members of Parliament have a constitutional right to speak any of Canada’s indigenous languages in Parliament. Given the logistic and economic challenges of official multilingualism based on the personality principle, some proponents of an equal right to the indigenous language have proposed a policy of official indigenous unilingualism based on the territoriality principle whereby a local or regional government would have an obligation to provide services only in the local indigenous languages but not in any other of Canada’s indigenous languages. Some First Nations already apply this principle on territory under their jurisdiction. Some have proposed that Canada adopt ‘sign language’ as one of its official languages. ‘For every child the same amount of money should be allotted for education. Parents should have the right to send their children to a school which teaches in the language of their choice. Education standards in all non-linguistic fields should be the same, but in all schools the first language, after the language of instruction, should be Esperanto. It should be taught for one year only on a daily basis. After this year, one subject, possibly geography, should be taught in Esperanto in order to keep the language skills alive. the right of official-language minorities to receive an education in their maternal language. However, among English-speaking Canadians there is only limited support for broadening the scope of official bilingualism, and reservations exist among Anglophones as to the intrusiveness and/or fairness of the policy. Among Francophones, polls have revealed no such reservations. Among Anglophones, support for providing federal French-language services to French-speakers living outside Quebec has remained consistently high over a quarter-century period—79% in 1977 and 76% in 2002. Over the same period, support among English-speakers for the "right to French language education outside Quebec where numbers make costs reasonable" has ranged from 79% to 91%. Among French-speaking Canadians, support for these policies was even higher. The national consensus has, at times, broken down when other aspects of official bilingualism are examined. However, a significant shift in anglophone opinion has occurred since the mid-2000s, in favour of bilingualism. According to a review of three decades' worth of poll results published in 2004 by Andre Turcotte and Andrew Parkin, "Francophones in Quebec are almost unanimous in their support of the official languages policy" but "there is a much wider variation in opinion among Anglophones ..."
This variation can be seen, for example, in responses to the question, "Are you, personally, in favour of bilingualism for all of Canada?" Between 1988 and 2003, support for this statement among Francophones ranged between 79% and 91%, but among Anglophones support was never higher than 48%, and fell as low as 32% in the early 1990s. The ebb in support for bilingualism among anglophones can likely be attributed to political developments in the late 1980s and 1990s, including the failure of the Meech Lake Accord, and the 1995 referendum on Quebec independence. By 2006, affirmative responses to the question "Are you personally in favour of bilingualism for all of Canada?" had increased considerably, with 72% of Canadians (and 64% of anglophones) agreeing. 70% of Canadians, and 64% of anglophones were "in favour of bilingualism for [their] province". Support for bilingualism is thought likely to continue to increase, as young anglophones are more favourable to it than their elders. According to Turcotte and Parkin, other poll data reveal that "in contrast to Francophones, Anglophones, in general, have resisted putting more government effort and resources into promoting bilingualism ... What is revealing, however, is that only 11% of those outside Quebec said they disagreed with bilingualism in any form. Opposition seems to be directed to the actions of the federal government, rather than to bilingualism itself ... [T]his distinction is key to understanding public opinion on the issue." This helps to explain results that would otherwise seem contradictory, such as a 1994 poll in which 56% of Canadians outside Quebec indicated that they either strongly or moderately supported official bilingualism, but 50% agreed with a statement that "the current official bilingualism policy should be scrapped because it's expensive and inefficient." In English Canada, there is some regional variation in attitudes towards federal bilingualism policy, but it is relatively modest when compared to the divergence between the views expressed by Quebecers and those expressed in the rest of the country. For example, in a poll conducted in 2000, only 22% of Quebecers agreed with the statement, “We have gone too far in pushing bilingualism,” while positive response rates in English Canada ranged from a low of 50% in the Atlantic to a high of 65% in the Prairies. Both French-speaking and English-speaking Canadians tend to regard the capacity to speak the other official language as having cultural and economic value, and both groups have indicated that they regard bilingualism as an integral element of the Canadian national identity. Once again, however, there is a marked divergence between the responses of French-speaking and English-speaking Canadians. In a 2003 poll, 75% of Francophones indicated that "having two official languages, English and French" made them proud to be Canadian. Among English-speakers, 55% said that bilingualism made them proud, but far higher percentages (86% and 94%, respectively) indicated that multiculturalism and the Charter of Rights made them feel proud. From time to time, boards or panels are commissioned, either by the federal government or the government of one of the provinces, to conduct hearings into the public’s views on matters of policy. Some of these hearings have dealt largely, or even primarily, with official languages policy, and the responses that they have collected provide snapshots into the state of public opinion at particular points in time. The Advisory Committee on the Official Languages of New Brunswick was commissioned by the provincial legislature as a way of determining the response of the population to the 1982 Poirier-Bastarache Report, which had recommended a considerable expansion of French-language services. Public hearings were conducted in twelve cities and towns across the province in 1985, and a report was submitted by the committee in 1986. In late 1990, a six-man Citizens’ Forum on Canada’s Future was established by the federal government with a mandate to engage in "a dialogue and discussion with and among Canadians ... to discuss the values and characteristics fundamental to the well-being of Canada". The Forum, which was headed by former Commissioner of Official Languages Keith Spicer, published a report in June 1991, which included a detailed discussion of Canadians’ reactions to a variety of issues, including federal official languages policy. These comments, which probably represent the most extensive consultation ever with Canadians on the subject of official bilingualism, were compiled statistically by the Spicer Commission, and tend to reinforce the findings of pollsters, that Canadians are favourable towards bilingual services, but frustrated with the implementation of official languages policy. Thus, for example, nearly 80% of group discussions sponsored by the Commission produced favourable comments from participants on what the Commission's report refers to as "bilingualism generally", but nearly 80% of these discussions produced negative comments on "official languages policy". “ Canada's use of two official languages is widely seen as a fundamental and distinctive Canadian characteristic. Among many, especially the young, the ability to speak, read and write both French and English is accepted as a significant personal advantage. Even many parents who dislike "official bilingualism" are eager to enrol their children in French immersion. On the other hand, we find that the application of the official languages policy is a major irritant outside Quebec, and not much appreciated inside Quebec ... In spite of real and needed progress in linguistic fair play in federal institutions, a sometimes mechanical, overzealous, and unreasonably costly approach to the policy has led to decisions to that have helped bring it into disrepute. Citizens tell us that bilingual bonuses, costly translation of technical manuals of very limited use, public servants' low use of hard-acquired French-language training, excessive designation of bilingual jobs, and a sometimes narrow, legalistic approach are sapping a principle they would otherwise welcome as part of Canada's basic identity. Francophone Association of Municipalities of Ontario seeks to oversee the maintenance and development of municipal government services in French, in Ontario municipalities with French-speaking populations. Impératif français seeks to promote the use of French within Quebec, and to challenge inequalities between the languages that may arise within areas of federal administration. The New Brunswick Association of English-speaking Canadians was formed in 1984 and disbanded in 1986. Its primary purpose was to oppose the proposals of the province's "Poirier-Bastarache Committee" for an expansion of the province's policy of official bilingualism. In the first decade or so following the 1969 adoption of the Act, opposition to the new policy sometimes took a radical form that has subsequently nearly disappeared. Books such as Jock V. Andrew's Bilingual Today, French Tomorrow, advocated either the repeal of the Official Languages Act or an end to the policy of official bilingualism. Leonard Jones, the mayor of Moncton, New Brunswick, was an aggressive opponent of bilingualism in the late 1960s and early 1970s. Jones challenged the validity of the Official Languages Act in court, arguing that the subject matter was outside the jurisdiction of the federal government. In 1974, the Supreme Court of Canada ruled against Jones, and found the law constitutional. In 1991, a local resurgence in anti-bilingualism sentiments allowed the Confederation of Regions Party to win 21.2% of the vote in New Brunswick's provincial election and to briefly form the official opposition with eight seats in the provincial legislature. Some organizations or individuals within certain movements also propose introducing a more inclusive language policy either via official multilingualism, or an official unilingual language policy in an auxiliary language so as to intrude minimally into the first-language choice of residents. Such ideas are sometimes inspired by Article 1 of the Universal Declaration of Human Rights relating to discrimination on the basis of language, and Article 26(3) of the same Declaration so as to give parents the freedom “to choose the kind of education that shall be given to their children.” Others can be inspired by religious or other beliefs. The French Nation of Canada (FRENCA): The NAFRAC favours a more interlingual approach to language policy that promotes the local sign language, the local indigenous language, Esperanto or another international auxiliary language, and more linguistic freedom in unofficial domains. The issues on which Canada’s political parties have most recently shown divergent voting patterns are two private members’ bills. The first, An Act to amend the Official Languages Act (Charter of the French Language) (Bill C-482), was introduced by Bloc MP Pauline Picard. If adopted, it would have had the effect of amending the Official Languages Act, the Canada Labour Code, and the Canada Business Corporations Act, to cause them to conform to the Charter of the French Language, “effectively making the federal government French-only in the province,” according to Maclean’s. This bill was defeated on May 2008, with Bloc and NDP MPs voting in favour and Conservative and Liberal MPs opposed. The second private member’s bill is NDP MP Yvon Godin’s Act to amend the Supreme Court Act (understanding the official languages) (Bill C-232). If adopted, this bill will have the effect of blocking any candidate who is not already sufficiently bilingual to understand oral arguments in both official languages from being appointed to the Supreme Court. This bill was passed at third reading on March 31, with all NDP, Liberal and Bloc members in support and all Conservative MPs opposed. but did not pass the Senate. "A belief that English and French have equality of status, and equal rights and privileges as to their use in all institutions of the Parliament and Government of Canada." "The Conservative Party believes that Canada’s official languages constitute a unique and significant social and economic advantage that benefit all Canadians. "i) A Conservative Government will support the Official Languages Act ensuring that English and French have equality of status and equal rights and privileges as to their use in all institutions of the Parliament and Government of Canada. "ii) The Conservative Party will work with the provinces and territories to enhance opportunities for Canadians to learn both official languages." Prior to this, in the 1980s and 1990s, the Reform Party of Canada had advocated the policy's repeal. However, the party's position moderated with time. By 1999, the Blue Book (the party's declaration of its then-current policies) stated that "The Reform Party supports official bilingualism in key federal institutions, such as Parliament and the Supreme Court, and in critical federal services in parts of the country where need is sufficient to warrant services on a cost-effective basis." By 2002, the policy declaration of the Reform Party's political successor, the Canadian Alliance, had been moderated further, and stated that it was "the federal government's responsibility to uphold minority rights" by providing services in both languages in any "rural township or city neighbourhood where at least ten percent of the local population uses either English or French in its daily life". 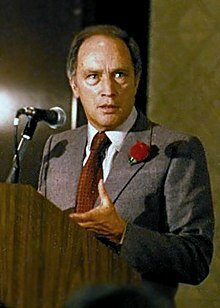 The Liberal Party sees itself as the party of official bilingualism, as it was a Liberal prime minister, Pierre Trudeau, who enacted the first Official Languages Act in 1969 and who entrenched detailed protections for the two official languages in the Charter of Rights and Freedoms in 1982. The depth of the party’s commitment to official bilingualism is demonstrated by the fact that the constitution of the Liberal Party contains provisions modelled almost word-for-word on Section 16(1) of the Charter of Rights: "English and French are the official languages of the Party and have equality of status and equal rights and privileges as to their use in all federal institutions of the Party. In pursuing its fundamental purposes and in all its activities, the Party must preserve and promote the status, rights and privileges of English and French." New Democrat MPs voted in favour of the 1969 Official Languages Act, the 1988 Official Languages Act, and the protections for the two official languages contained in the Charter of Rights. More recently, the party has edged towards supporting an asymmetrical version of bilingualism. Early in 2008, the party’s languages critic, Yvon Godin, stated that its MPs would vote in favour of a bill, sponsored by the Bloc Québécois, which would cause federal institutions to operate on a French-preferred or French-only basis in Quebec. In 2017, NDP MP Romeo Saganash spoke forcefully against making Anglo-French bilingualism a requirement for Supreme-Court judges in addition to criticizing official bilingualism generally due to the linguistic barriers it imposes on indigenous candidates. Although the main objective of the Bloc Québécois is to assist in the secession of Quebec, the party’s parliamentary caucus has maintained an active interest in issues relating to official languages policy (for example, sending MPs to participate in the standing Commons committee on official languages). The party seeks to alter federal language policy, as it applies within Quebec, so as to eliminate the statutory equality of English that is guaranteed under the Official Languages Act and other federal legislation. In recent years, this has included introducing a private member's bill titled An Act to amend the Official Languages Act (Charter of the French Language) (better known as Bill C-482), intended to supersede the Official Languages Act with the Charter of the French Language for all federally regulated corporations within Quebec, this principle uses an asymmetrical conception of federalism in Canada. ^ Toolkit, Web Experience (30 March 2014). "Canada's official languages and you". www.clo-ocol.gc.ca. ^ "Official Languages Act – 1985, c. 31 (4th Supp.)". Act current to July 11th, 2010. Department of Justice. Retrieved 2010-08-15. The purpose of this Act is to (a) ensure respect for English and French as the official languages of Canada and ensure equality of status and equal rights and privileges as to their use in all federal institutions, in particular with respect to their use in parliamentary proceedings, in legislative and other instruments, in the administration of justice, in communicating with or providing services to the public and in carrying out the work of federal institutions; (b) support the development of English and French linguistic minority communities and generally advance the equality of status and use of the English and French languages within Canadian society; and (c) set out the powers, duties and functions of federal institutions with respect to the official languages of Canada. ^ a b "French Language Services Policy" (PDF). Government of Manitoba. Mar 1999. ^ "Pas de statut bilingue pour l'Alberta et la Saskatchewan, tranche la cour". Quebec.huffingtonpost.ca. 2014-02-21. Retrieved 2015-10-29. ^ "Pierre Elliott Trudeau - Biography & Facts". Encyclopedia Britannica. ^ Web, Boîte à outils de l'expérience (6 March 2015). "Portrait des groupes de langues officielles de la région d'Ottawa". www.clo-ocol.gc.ca. ^ Conrad-Avarmaa, Brigitte (3 November 2017). "The RMC Brochure". www.rmc-cmr.ca. ^ "Ottawa Bilingual City - Ottawa ville bilingue". ^ "Canadian charter of rights and freedoms: Official Languages of Canada". Department of Justice Canada. 1982-04-17. ^ "French Education System Admission Criteria | Fle". Elfontario.ca. Retrieved 2015-10-29. ^ "Canadian charter of rights and freedoms: Minority Language Educational Rights". Department of Justice Canada. 1982-04-17. ^ "Introduction". Final Report of the French Constitutional Drafting Committee. Archived from the original on 2003-09-23. Retrieved 2007-12-18. ^ Schedule 'A' of the Canada Act is a French version of the operative clauses of the Canada Act. Schedule 'B' contains the text of the Constitution Act, 1982, in both English and French. ^ "Official Languages Act (1969) - The Canadian Encyclopedia". www.thecanadianencyclopedia.ca. ^ "Official Languages Act". Office of the Commissioner of Official Languages. 2003-09-01. Archived from the original on 2006-11-06. ^ "Official Languages Act Annotated version – Explanatory notes". Office of the Commissioner of Official Languages. 2003-09-01. Archived from the original on 2006-10-10. ^ "Official Languages Act – Part V – Language of Work". Department of Justice Canada. 2007-04-04. Archived from the original on 2006-10-10. ^ "Official Languages Act – Part VI – Participation of English-speaking and French-speaking Canadians". Department of Justice Canada. 2007-04-04. Archived from the original on 2006-10-10. ^ "Welcome to the Office of the Commissioner of Official Languages!". Office of the Commissioner of Official Languages. 2003-09-01. ^ "Official Languages Act – Part VIII – Commissioner of Official Languages". Department of Justice Canada. 2007-04-04. ^ "Definition of English or French Linguistic Minority". Department of Justice Canada. 2007-04-17. ^ "Calculation of Population Numbers". Department of Justice Canada. 2007-04-17. ^ "Official Languages Regulations". Office of the Commissioner of Official Languages. 2003-09-01. Archived from the original on 2006-11-10. ^ a b c "Information archivée dans le Web" (PDF). publications.gc.ca. ^ Eugene Forsey writes: “In the Dominion Civil Service, Côté’s ‘’Political Appointments’’, 1867–1895, shows that, over that period, eliminating duplications, the French Canadians had rather over a third of the official of the House and of the two Dominion Courts; rather less than a third of other officials of the rank of Deputy Minister and, of the officials from Chief Clerk up to Deputy Minister rather less than one-seventh.” Source—Eugene Forsey, ‘’Freedom and Order: Collected Essays.’’ Ottawa: Carleton University Press, 1974, p. 243. ^ "Manitoba Act, 1870". Parliament of Canada. 12 May 1870. ^ "The French Language in Manitoba: French-Canadian and European Roots". Encyclopedia of French Cultural Heritage in North America. ^ "Controversy and Compromise over the Manitoba Schools Question". Canada's History. Archived from the original on 2014-05-27. ^ a b c "The French Language Debate" (PDF). Manitoba Law Journal. 2003. ^ "Re Manitoba Language Rights,  1 S.C.R. 721". Supreme Court of Canada. June 13, 1985. ^ "Perceived Threat to the French Language and Culture and Support for Bilingualism in Canada". Association for Canadian Studies. Jan 1, 2003. ^ "Official Language Policies of the Canadian Provinces" (PDF). Fraser Institute. Jan 16, 2012. Archived from the original (PDF) on 2012-04-28. ^ "Going to School". Government of Manitoba. ^ "Bref Historiquel". Université de Saint-Boniface. ^ Toolkit, Web Experience (23 March 2014). "Official languages in the provinces and territories". www.clo-ocol.gc.ca. ^ a b c d e f Constitution Act, 1867, s 133. ^ Canadian Charter of Rights and Freedoms, ss 16(1), 17(1). ^ Official Languages Act, RSC 1985, c 31 (4th Supp), s 4. ^ Canadian Charter of Rights and Freedoms, s 18(1). ^ Official Languages Act (Canada), Part II. ^ Canadian Charter of Rights and Freedoms, s 19(1). ^ Official Languages Act, (Canada), Part III. ^ Languages Act (Alberta), s 3. The only exception is the Languages Act itself, which is bilingual. ^ Languages Act (Alberta), s 4. ^ a b c d e f g h i j k De facto; no legislative provision deals with this issue. ^ Supreme Court Civil Rules, B.C. Reg. 168/2009, rr. 1‑1, 1‑3, 22‑3(2), (3); Conseil scolaire francophone de la Colombie-Britannique v. British Columbia, 2013 SCC 42,  2 SCR 774. ^ a b c Manitoba Act, 1870, s 23. ^ Canadian Charter of Rights and Freedoms, ss 16(2), 17(2). ^ Official Languages Act, SNB 2002, c O-0.5, ss 6, 7, 8. ^ Canadian Charter of Rights and Freedoms, s 18(2). ^ Official Languages Act (New Brunswick), ss 9 to 13. ^ Canadian Charter of Rights and Freedoms, s 19(2). ^ Official Languages Act (New Brunswick), ss 16 to 21. ^ The only exception is the bilingual French-language Services Act, SNS 2004, c 26. ^ French Language Services Act, RSO 1990, c F.32, s 3(1). ^ French Language Services Act (Ontario), ss 3(2), 4. ^ Courts of Justice Act, RSO 1990, c C.43, ss 125, 126. ^ The only exception is the bilingual French Language Services Act, RSPEI 1988, c F-15.2. ^ a b Charter of the French Language, CQLR, c C-11, s 7. ^ The Language Act, s 4. ^ The Language Act, s 11. ^ Official Languages Act, RSNWT 1988, c O-1, s 6. The other official languages, set out in s 4 of the Act, are: Chipewyan, Cree, Gwich’in, Inuinnaqtun, Inuktitut, Inuvialuktun, North Slavey, South Slavey and Tłı̨chǫ. ^ Official Languages Act (Northwest Territories), s 7. ^ Official Languages Act (Northwest Territories), s 9. ^ Official Languages Act (Nunavut), s 5. ^ Official Languages Act (Nunavut), s 8. ^ Languages Act, RSY 2002, c 133, s 3. ^ Languages Act (Yukon), s 4. ^ Languages Act (Yukon), s 5. ^ Report of the Royal Commission on Bilingualism and Biculturalism, Book I (General Introduction), Ottawa: Queen's Printer, p. xxviii, at paragraph 29. ^ Statistics Canada, 2006 Census Profile of Federal Electoral Districts (2003 Representation Order): Language, Mobility and Migration and Immigration and Citizenship. Ottawa, 2007, p. 6, line 108. In 2006, Canada’s population was 31,241,030. Of this, 520,385 Canadians, or 1.7%, did not speak either official language. ^ Statistics Canada, 2006 Census Profile of Federal Electoral Districts (2003 Representation Order): Language, Mobility and Migration and Immigration and Citizenship. Ottawa, 2007, pp. 2, 6. Statistics Canada collects data on mother tongue, on "first official language spoken", and on bilingualism in French and English. However, the agency does not collect data on bilingualism in non-official languages (either persons who speak more than one non-official language, or who have an official language as their mother tongue and afterwards learn a non-official language). Thus, it is possible only to determine that 6,147,840 Canadians have a non-official language as their mother tongue (see p. 2, line 5), and that 520,385 Canadians do not speak either official language (see p. 6, line 108). Since all persons who speak neither official language must have a non-official language as their mother tongue, simple subtraction shows that 5,627,455 Canadians, or 18.0% of the population, are bilingual in a non-official language plus an official language. ^ Statistics Canada, 2006 Census Profile of Federal Electoral Districts (2003 Representation Order): Language, Mobility and Migration and Immigration and Citizenship. Ottawa, 2007, pp. 6, 60. ^ Statistics Canada, Population by knowledge of official language, by province or territory (2006 Census), http://www.statcan.gc.ca/tables-tableaux/sum-som/l01/cst01/demo15-eng.htm. The 2006 census shows that 3017,860 Quebecers are bilingual, out of a total of 5,448,850 bilingual Canadians. ^ See Jesse Robichaud, "Keep parents involved in language education: Lord," in the Moncton Times and Transcript, February 21, 2008, and Daniel McHardie, "Language battle: Education Minister will seek public input before responding to French Second Language Review," in New Brunswick Telegraph-Journal, February 28, 2008, p. A1. ^ Canada, Privy Council Office, "The Next Act: New Momentum for Canada's Linguistic Duality—The Action Plan for Official Languages." Ottawa, 2003, p. 27. ^ New Brunswick Department of Education, Policy Statement on Immersion and the Core Program. Fredericton, 1983, p. xii. ^ Catherine Steele, Can Bilingualism Work? Attitudes Toward Language Policy in New Brunswick: The 1985 Public Hearings into the Poirier-Bastarache Report. Fredericton: New Ireland Press, 1990, p. 26. ^ Official Languages: Annual Report 2007–2008, Volume 1, Official Language Support Programs". Canadian Heritage, cat. No. CH10-2008-1, 2008, pg. 31. ^ "Ontario | Provincial Curriculum Guides | Program Support Materials (Teachers & Administrators) | French as a Second Language | Resources for Teachers". Caslt.org. Retrieved 2015-10-29. ^ Wendy Carr. "Intensive French – A British Columbia Perspective". Mmecarr.ca. Retrieved 2015-10-29. ^ "Current Status of the Education System in New Brunswick" (PDF). Gnb.ca. January 30, 2005. Retrieved 2015-10-29. ^ "Montreal Mirror - The Front Page : Education". archive.org. 5 May 2003. ^ "Adults With Inadequate Literacy Skills - Education Provincial Rankings - How Canada Performs". www.conferenceboard.ca. ^ a b "Lessons. in Learning. Parlez-vous français? The advantages of bilingualism in Canada - PDF". docplayer.net. ^ "Information archivée dans le Web" (PDF). publications.gc.ca. ^ Branch, Legislative Services (15 January 2019). "Consolidated federal laws of canada, Consumer Packaging and Labelling Act". laws-lois.justice.gc.ca. ^ a b "AFN asks Ottawa to declare all aboriginal languages official" – via The Globe and Mail. ^ a b c Comment, Full (10 November 2017). "Chris Selley: Indigenous MP opposes fellow New Democrats on official bilingualism for Supreme Court - National Post". ^ "Top court's bilingual rule a barrier to indigenous judges: Sinclair, Bellegarde" – via The Globe and Mail. ^ "English set to decline as a world language". The Independent. 27 February 2004. ^ Dean, Sam (29 May 2015). "Why a made-up language from 1887 is making a digital comeback". The Verge. ^ Scott Reid. Lament for a Notion. ISBN 0889782695. 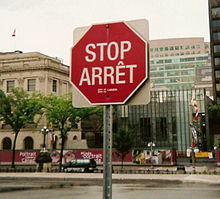 ^ "Charest proposes broadening Quebec language laws". CBC News. 28 August 2012. ^ Montgomery, Sue (30 January 2015). "Quebec raises ire of francophones in the rest of Canada". Montreal Gazette. ^ Hélène Asselin (5 September 2017). "Un commentaire pour "Le Québec et la francophonie canadienne : Une position contradictoire"". Observatoire national en matière de droits linguistiques. La position du Québec est d’autant plus difficile à expliquer que, comme le rappelle clairement le professeur Beaulac dans son blogue du 12 mai 2016, « Asymétrie Canada-Québec en droits linguistiques », la spécificité linguistique de la province est, juridiquement pleinement reconnue (art. 59 de la Loi constitutionnelle de 1982, décisions de la Cour suprême, etc.). Il est incompréhensible que le gouvernement du Québec ne mise pas sur cette reconnaissance et soit si hésitant à appuyer la défense juridique des minorités francophones. ^ "Committee considers Indigenous language use on Parliament Hill - APTN NewsAPTN News". aptnnews.ca. ^ "Sign language should be 3rd official language, say those at Regina rally". CBC News. 23 September 2018. ^ "Universal Declaration of Human Rights". www.un.org. 6 October 2015. ^ Andrew Parkin and Andre Turcotte, Bilingualism: Part of Our Past or Part of Our Future?. CRIC Paper #13. Ottawa: Centre for Research and Information on Canada. March 2004, p. 6. ^ Parkin and Turcotte, p. 9. This is the wording used in the 2002 poll. In the 1977 poll, respondents were asked whether they supported "the provinces providing opportunities and facilities for education in French wherever practicable". ^ a b c d "OCOL – 1. General Support for Bilingualism". Ocol-clo.gc.ca. 2009-09-24. Retrieved 2010-07-26. ^ Parkin and Turcotte, p. 2. ^ Parkin and Turcotte, p. 8. A parallel question, "Are you in favour of bilingualism for your province?" also received a much more favourable response from Francophone respondents (most of whom were located in Quebec) than from Anglophone respondents, indicating that Francophones were consistently more supportive than Anglophones of a fully bilingual Quebec within a fully bilingual Canada, whereas Anglophones were consistently more supportive than Francophones of a unilingual French Quebec within a Canada where the other provinces are for the most part unilingual English. ^ Parkin and Turcotte, p. 10. The specific reference is to a 1977 poll in which 54% of non-Quebecers but only 34% of Quebecers identified with the statement, "I generally agree with or support the principle of bilingualism but I disagree with the form bilingualism has taken under the present federal government." ^ Angus Reid Group, "The National Angus Reid/Southam News Poll: Canadians' Views on Official Bilingualism". Release date: April 29, 1994. ^ Parkin and Turcotte, p. 11. ^ Parkin and Turcotte, pp. 20–21. ^ Parkin and Turcotte, p. 13. ^ New Brunswick. Official Languages Branch (Bernard Poirier and Michel Bastarache). Towards Equality of Official Languages in New Brunswick. 1982. ^ New Brunswick (Irene Grant-Guerette and Lloyd B. Smith). Report of the Advisory Committee on Official Languages of New Brunswick. 1986. ^ Catherine Steele, Can Bilingualism Work? Attitudes Towards Language Policy in New Brunswick: The 1985 Public Hearings on the Poirier-Bastarache Report. Fredericton: New Ireland Press, 1990, p. 89. ^ Citizens' Forum on Canada's Future, Report to the People and Government of Canada. Ottawa: Minister of Supply and Services, 1991, p. 161. ^ Citizens' Forum on Canada's Future, Report, pp. 125–126. ^ "Alliance for the Preservation of English in Canada: Change of name and relocation of head office". Canada Gazette. 2000-02-26. Archived from the original on 2012-02-04. ^ "Supplementary letters patent (name change)" (PDF). Canada Gazette Part I, p. 3872. 2001-10-06. Archived from the original (PDF) on 2012-03-21. ^ Martin Patriquin, “Are you still here?” Maclean’s, February 25, 2008, p. 23. ^ "Official Report * Table of Contents * Number 095 (Official Version)". .parl.gc.ca. Retrieved 2015-10-29. ^ "Official Report * Table of Contents * Number 021 (Official Version)". .parl.gc.ca. Retrieved 2015-10-29. ^ Conservative Party of Canada Policy Declaration, March 2005, p. 32 (Policy #91). ^ The 'Blue Book': Principles and Policy of the Reform Party of Canada – 1999, p. 40. ^ Canadian Alliance Declaration of Policy, April 2002, pp. 12–13. ^ Liberal Party of Canada, “Constitution”, as adopted and amended at the biennial convention, November 30 – December 1, 2006, Section 2(3). Unilingual for Alberta and Saskatchewan.